When I was a kid, I played competitive tennis. We lived in Colorado where winters were cold and court time was expensive. So I often practiced very early in the morning or late at night when it was easier and cheaper to reserve a court at the indoor tennis club in our town. I also traveled to tennis tournaments which sometimes required catching a flight or getting on a bus at 5:00 a.m. No matter how early I had to leave, my mom would always get up to make me breakfast before sending me off. I especially remember the days when she would pop those Pillsbury cinnamon rolls with orange glaze in the oven for a 4:00 a.m. pre-tennis breakfast. I loved the way they made the house smell and the sweet sticky glaze on top. And while I’m sure I never expressed it back then, I loved that even when my dad was driving me or someone was picking me up, my mom always, always got up to feed me. One morning a couple of months ago, when we were in California visiting my parents, my mom made us all cinnamon rolls for breakfast. Emmett claimed that he did not like cinnamon rolls and then proceeded to devour at least two big ones. I wasn’t surprised, given my healthy appreciation for them. And I couldn’t help but remember those early tennis mornings from my childhood. Watching him eat the rolls with gusto made me think about food memories and family rituals. And that got me to thinking that we should have something special for Holiday breakfasts. Something the kids look forward to and always remember the way I remember 4:00 a.m. cinnamon rolls. 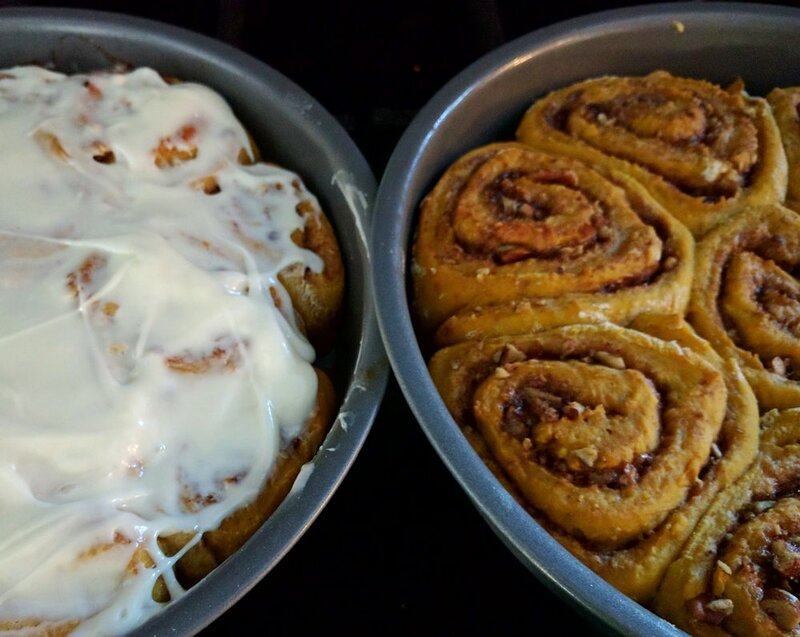 So, seeing as most of us were verified cinnamon roll lovers, I thought it would be nice to make them as a special Thanksgiving breakfast this year. Because I could make them the night before and let them rise overnight in the fridge, I knew they would be a low-maintenance breakfast that would allow me to focus on cooking the “real food” for the day. When we woke up, all I had to do was leave them on the counter for an hour or so before popping them in the oven. "MORE!" Another cinnamon roll lover. They were a hit with the kids who love, and often request a “special breakfast” on the weekends or on Holidays. Perhaps the best part is that the recipe makes 16 rolls in two cake pans - so I had one leftover for the freezer. I plan on defrosting them overnight in the refrigerator on Christmas Eve so that we can have another “special breakfast” on Christmas. The kids have actually asked to have them again a handful of times in the last two weeks, so I think they will be a welcome addition to our Christmas morning activities. This recipe is adapted slightly from the book Baked Elements by Matt Lewis. I add salted chopped pecans to the filling because the saltiness and texture of the nuts cuts some of the sweet and softness of the rolls as they would be otherwise. I went back and forth on when and how to freeze them before deciding to simply freeze them fully baked and frosted so that I can reheat them (after defrosting overnight) in a 250 degree oven for about 20 minutes. While I have yet to test this, I’m pretty confident that they will be just as good this way. I’m already looking forward to indulging in one of these with a big cup of coffee on Christmas morning. Melt the butter in a small saucepan or the microwave. Remove from heat and set aside to cool slightly. Add yeast to milk in a small bowl and set aside. After a few minutes, it should start to foam, if it doesn’t your yeast might be bad. Try it again with new yeast. In the bottom of the bowl of an electric mixer fitted with the paddle attachment, combine flour, sugars, salt and spices. Add about 3/4ths of your melted butter, reserving the other 1/4th for assembly, and stir to combine. Add yeast-milk mixture, pumpkin and egg and mix until combined. Switch mixer to a dough hook and knead on low for about 5 minutes. Place mixture in a large oiled bowl and cover with plastic wrap. Set aside for 1 hour in a warm place until the dough just about doubles. Spray two 9-inch round cake pans with cooking/baking spray. To assemble buns: Once dough has nearly doubled, turn it out onto a well-floured surface and roll the dough to an approximately 16×11-inch rectangle. Brush with reserved butter. Stir filling ingredients together in a bowl and sprinkle mixture evenly over your dough rectangle. Roll the dough into a tight spiral. Cut into 16 equal sized rolls by applying minimal pressure to the rolled up dough and slicing with a serrated knife (this helps to avoid squishing the rolls when they are cut). Cutting with dental floss also works well. Place 8 buns in each prepared pan. Cover and place in refrigerator overnight. In the morning, take buns out and leave on the counter for 1 hour. Meanwhile, preheat oven to 350F and make glaze. To make glaze: Beat cream cheese until it is light and fluffy. Add sugar and vanilla. Drizzle in milk a little at a time until glaze is the right consistency - spreadable or pourable. We like it on the thicker side. She loved them too! YAY! I found something we can all get excited about.